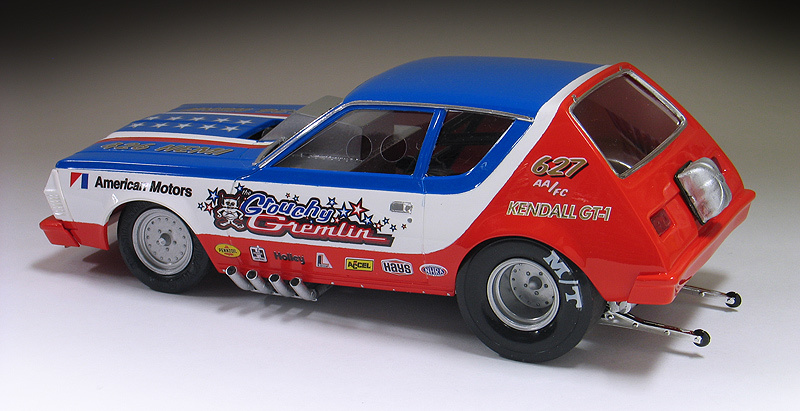 The model kit manufacturer AMT made a series of fictional short wheel based funny cars model kits during the '70's. The kits all shared the same chassis but had different bodies. 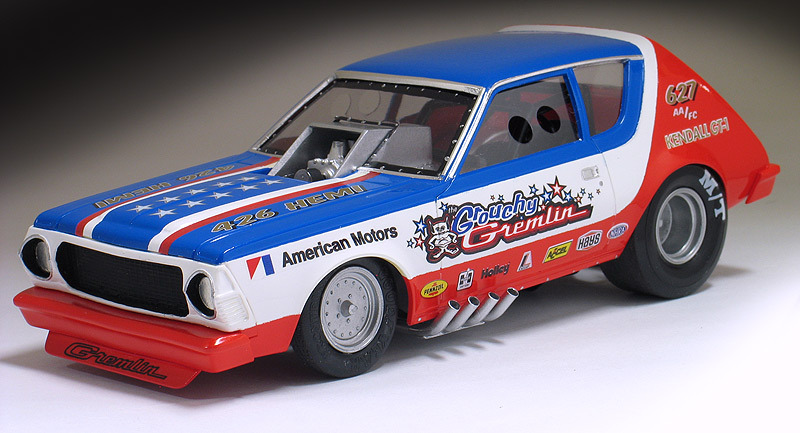 The bodies included a Gremlin, a Pinto and a Vega Wagon. 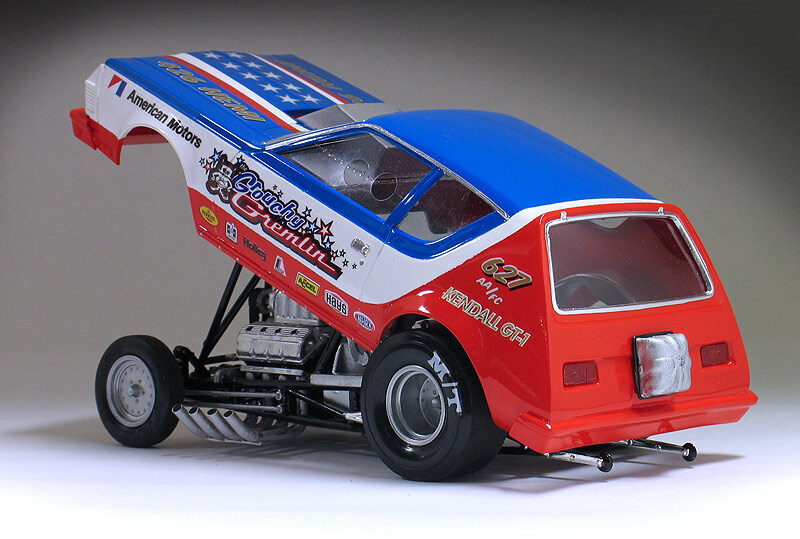 I don't think any drag racing teams actually ran these short wheel-based machines, but I still think they look pretty cool. Recently, I purchased a version of all three kits from various sources. 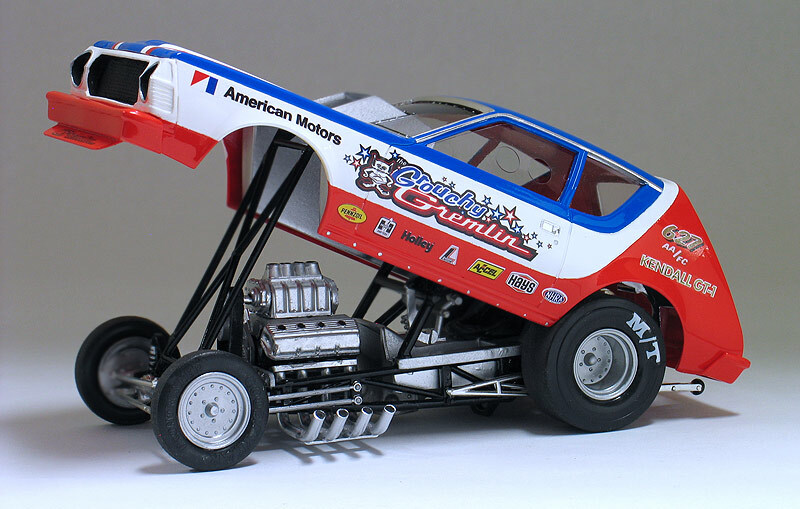 I built the Pinto a couple of years ago and I just recently finished this 1975 American Motors Gremlin funny car. The Vega funny car still awaits its turn on my work bench. I carefully disassembled the Gremlin and soaked all the parts in Castrol Super Clean to remove the old paint. The body was then cleaned up and some of the trim removed to make it look more like a one piece fiberglass funny car body. This included fixing the bumpers to the body and removing the bumper guards. I made the front spoiler from sheet styrene. Lastly, I also enlarged the rear wheel wells because I wanted to use a larger drag slick. 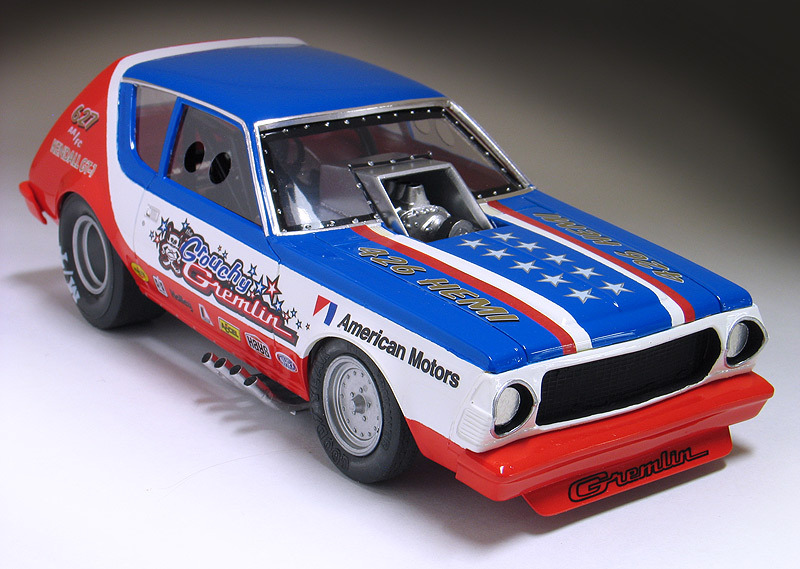 For the paint scheme I was inspired by the factory race teams American Motors used to sponsor back in the '70's. Their teams were always red, white and blue and I liked the look. Since my car is fictional I designed my own graphics for my "Grouchy Gremlin" and made a set of custom decals. The name was suggested by someone on the Spotlight Hobbies message board. The small sponsor decals were left over bits I had from various decal sheets. 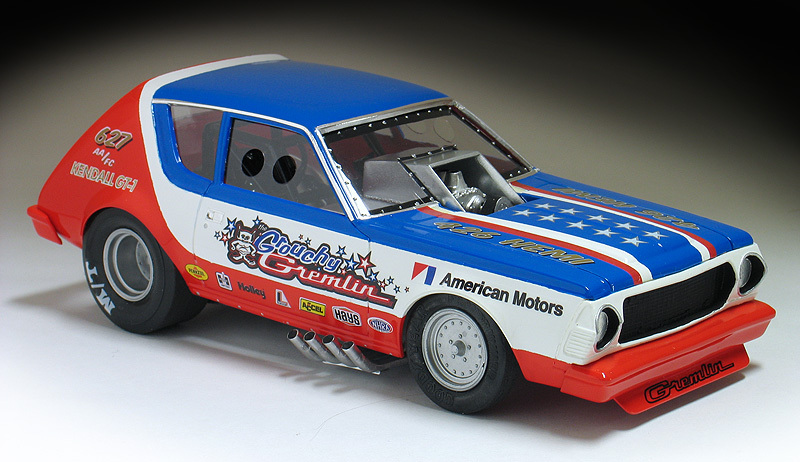 The red, white and blue paint work was all done with Tamiya sprays followed by a PPG urethane clear coat. The chassis and engine was re-built pretty close to box stock. The built-up I received was missing a few engine parts, so I replaced them with parts from my parts box. I don't really enjoy engine wiring tasks so I kept the detailing limited to paint. I also narrowed the rear axle so I could tuck the big rear slicks inside the body. I also made new side windows from clear sheet acetate and added vents with a hole punch. 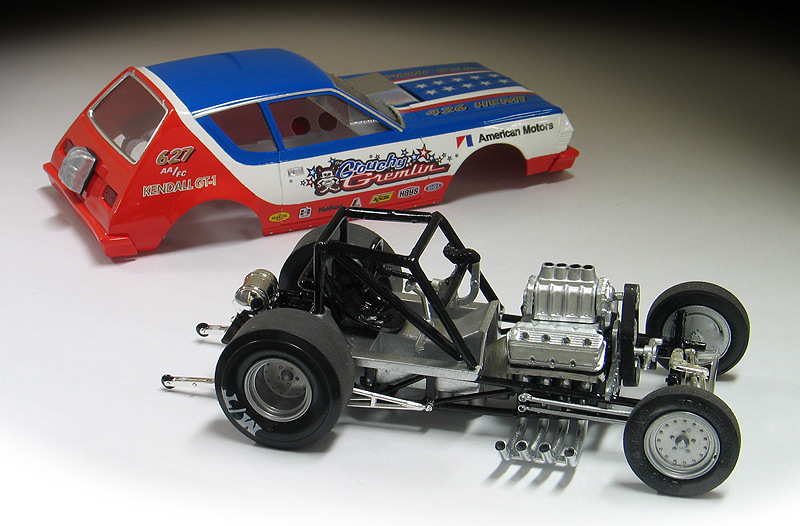 This kit originally came with a set of custom wheels that were more appropriate for an early '70's funny car. 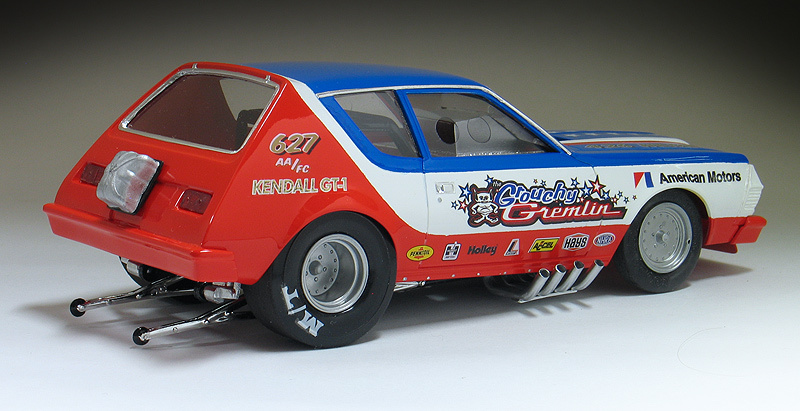 Since mine is a 1975 model year Gremlin, I replaced the wheels with a set of my own resin Cragar Supertrick wheels. By the mid '70's most funny car teams had switched to this style of wheel. This was a pretty simple build but I liked the way it turned out. I think's it time to build that Vega kit now.